Some people are just so incredibly generous it's enough to make a gal smile from ear to ear. Yesterday, armed with bushel baskets, a pole harvester, my brother and my friend Andi, I drove out to a local farm where one of my students lives with her parents, dogs and three gorgeous grey horses (Trust me, I see a lot of horses... these three are exceptional!) Their place is set back from the road a bit and it's a beautiful home horse farm, just far enough off the road to feel secluded and peaceful, and not so far from town as to be a hassle. On part of the front acre of their property lies an old orchard, planted by the original owner in the 1970's, with eight remaining apple trees, three pear trees and a very gnarly (mildly unhappy looking) apricot tree. The trees are perfectly spaced, and while they are incredibly overgrown, they are unsprayed and they produce apples with minimal sooty blotch, scab and pests. Every organically grown apple is bound to have some spots, and these wear their spots beautifully and with pride! My student and her mother had offered to let me pick their apples (and I made sure to repeatedly say "Are you sure you don't mind if I pick LOTS of apples?") since they don't do a whole lot with them and have to rake them up at the end of the year to keep the pasture healthy for the horses' rotational grazing. So we started the afternoon off with some lively irish jigs and reels played on someone's iPhone and skillfully amplified by placing said phone in a galvanized bucket (it works, guys!) and picking was easy. 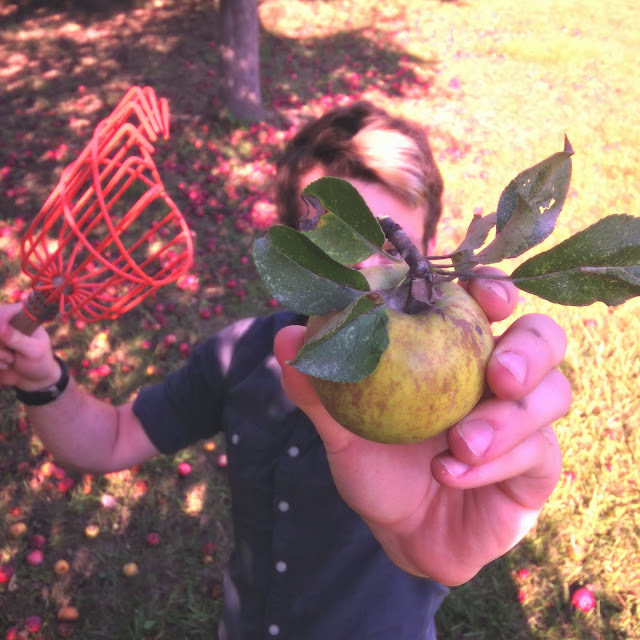 This year's bumper crop of apples has provided people with such an overabundance of apples that it would be impossible to keep up with even the smallest of home orchards. I'm not even sure we made a dent in the trees' ample boughs. The sun was shining and the air was breezy and everyone was smiling for hours as we picked from the trees. Of course I had envisioned it a lot like this, with everyone happy and singing songs, but I never expected it to turn out like that! Generally it starts out like that and after an hour everyone is bored and looking for other things to do. Except for a quick game of apple-baseball (played to the tunes of the Andrews Sisters and the Glenn Miller Orchestra), we worked diligently for over three hours, finishing with a bit of an exhausted flop back into the gator (which my student's father graciously offered to let us use to transport apples from the orchard). Our haul? Over five bushels of a variety of different mystery apples (which I am currently working on identifying). They range from large, juicy and sweet dessert apples to cider apples, and some are definitely winter storage apples, similar to Winesap! My favorite was definitely the yellow russeted variety that I suspect is a cider apple. It has incredibly complex flavor and there were so many of them we couldn't help but pick almost a bushel and a half of them, alone! Did I mention we got a little slap happy toward the end? What a great day! I don't think there is much on earth that is as simply tasteful as duck fat fries, except perhaps when you sprinkle a bit of truffle-infused salt on said fries. So, when I was wandering around the Ann Arbor farmers market this past Wednesday it suddenly hit me. 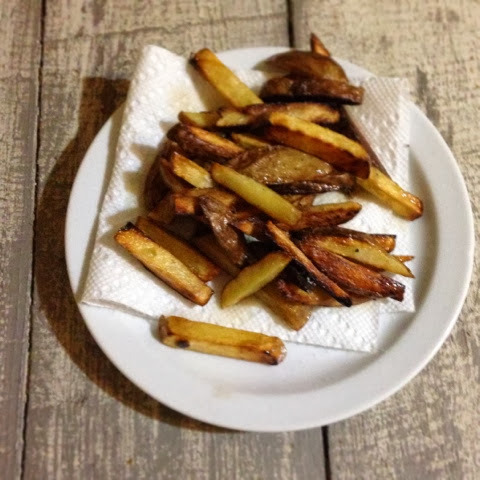 I needed to make my own duck fat fries! I snatched up some nameless potatoes that ended up being a bit buttery in texture and headed home, determined to make it work. For my first batch, I just sliced fries and tossed them in the pan with some fat and crossed my fingers. They took forever to cook (ah, duh...) and ended up very dark and oily. The second batch, however, was perfect (if I do say so myself)! I precut the fries, tossed them in a bowl and microwaved them for 60-120 seconds on high. This kind of pre-cooked the potatoes. I assumed this was going to make them super fragile, but they weren't too hard to manage. I turned the stove to medium-high heat and then tossed these into the pan with the hot, melted duck fat (you can get duck fat at some specialty grocers and butcher shops, did I mention? Or render your own - I'll post about this in a couple weeks when I take a few of the mature farm ducks to freezer camp) and let the fries sit for a few minutes before disturbing. As they develop a light brown crust, move them around the pan. When they're finished, simply pull them out and place them on something to absorb the excess oil. As they drain, sprinkle them with your favorite salt. The flavor imparted by the duck fat is deep and earthy (an almost terroir effect) but it remains neutral enough to showcase a special salt if you have one. I am a huge fan of truffle salt, and the deep musky mushroom flavor compliments the existing flavor seamlessly. You can then pour off the excess fat into a heat-resistant container to use again! Or, if you've used an iron pan, you can leave a bit of oil in there to sit if you plan to use your pan again soon. I have yet to have duck fat go rancid on me, and it should be relatively stable as long as there isn't a bunch of potato crud in your pan. I'll be making eggs in that mess for breakfast! 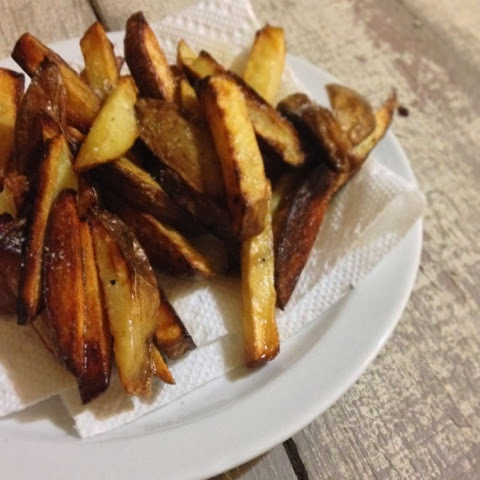 Anyway, these fries ended up just as delicious and crispy as the fries we've had at restaurants that have been deep fried in fat, but this method is quick and easy for a deep-fry-fearer like myself! Do you have a favorite animal fat to use in cooking? In case you didn't know, my DH and I live in a cottage on an old estate that also has a wild and unruly antique orchard on it. The trees are scattered across roughly an acre and they twist and gnarl with at least 50 years of untended growth. 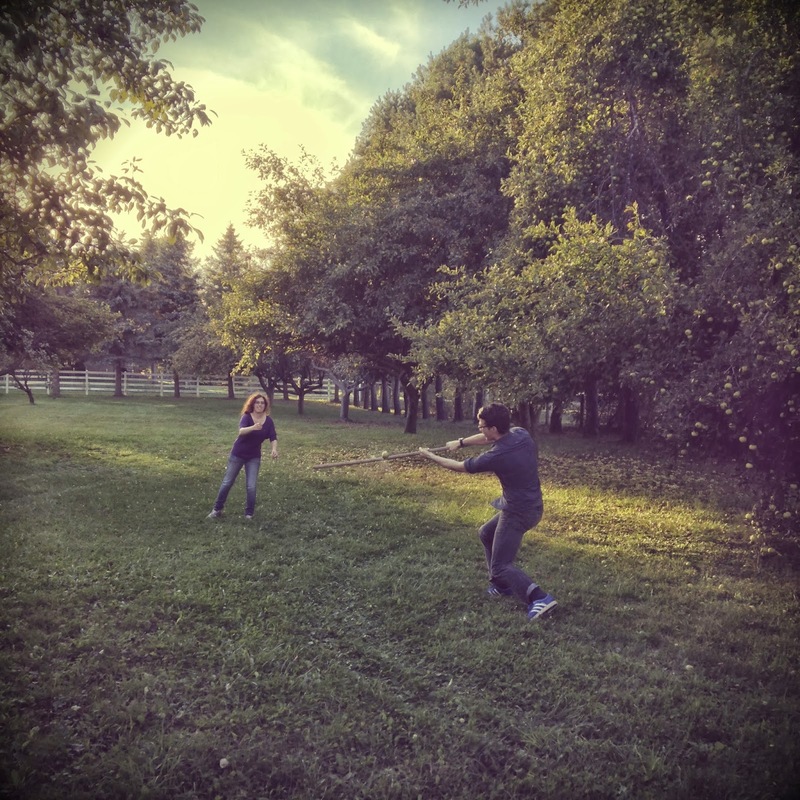 In Michigan, our apples are producing a bumper crop state-wide and so my poor old trees are heavy with fruit and feeling some serious stress. Every time we get a strong wind you can hear the branches creaking and cracking under the weight of this massive crop, and these trees are primarily late autumn storing apples, so they will continue to hold onto their apples at least until we get a hard freeze! This is the first year I've seriously picked the apples in our orchard. In the past for some reason I believed they were too buggy for human consumption, but upon closer inspection this year I've found that many of them are flawless, and even those that aren't won't kill me to consume. 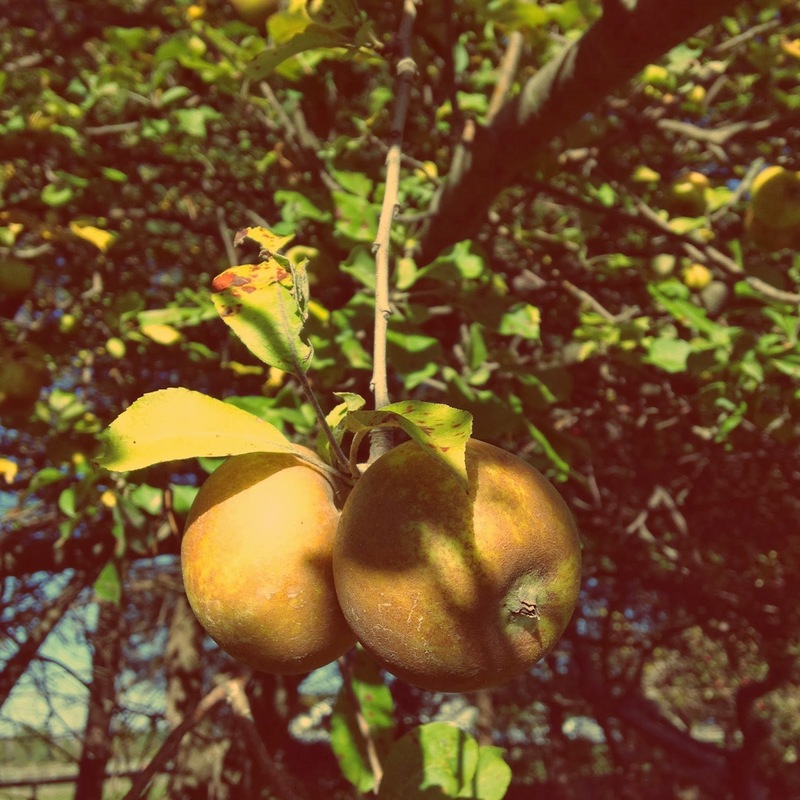 So yesterday I set out to pick a few bushels of apples for various projects. The picking was great! I have no idea what these trees are, though I suspect they are a few different varieties. I have a book that helps identify apples, but I'll have to do some serious investigation to figure these guys out. All I know is, they're delicious! The tree that I picked most of my haul from has small apples that have a bit of spice, a lot of tannin, a sweet start and a tart finish, and a crisp white flesh, streaked with pink. The high tannin content (that puckery tchk-tchk taste - try to pronounce that, you'll get what I mean) makes me think these would be amazing for a hard cider. I have a bushel of them sitting out front right now mellowing in the sun so that I can attempt to press them later this week. In the meantime, I decided to make some applesauce from some of the apples from a different tree. This tree produced incredibly sweet apples with a much thinner skin. They were much more suited to fresh eating, and the wasps thought so too! I only got stung once yesterday, which was a minor miracle, but it still hurt! I'm just glad it was one of those yellow jackets and not the bald faced hornets I saw buzzing around! I finally had a chance to use my antique apple slicer (the blades are cast into the base - what a neat find!) and whipped up my first ever batch of applesauce. It was still slightly tart, so I used a dollop of local honey in it to sweeten it. If you've never made applesauce before, I highly recommend it. You simply slice and core your apples, toss them in a pot (skin and all) with an inch of water on the bottom, cover and let steam/boil for 20-30 minutes and when you're finished you run them through a food processor or food mill. (I tossed a pinch of cinnamon into mine at this point.) I then canned a few jars of mine, which entailed sterilizing jars and filling them to 1/4" of the top, then sealing and hot-water-bathing them for 30 minutes. The finished result was a gorgeous, bright pink apple sauce that had a nice balance of sweetness and tartness. Apples all vary, though, so make sure you taste test yours before adding sweeteners or canning. What is your favorite way to use a bumper crop of apples? So this becomes a problem when I decide I want to share something with you all, but I will try my best here... It's a sort of abstract recipe anyway. First toss a cup and a half of masa harina with about 1/4 teaspoon of baking powder and top it off with a sprinkle of course fleur de sel and a pinch each of cinnamon and smoked chipotle powder (you could use cayenne or skip this all together). Then add two drizzly tablespoons of honey and a fresh egg, and proceed to add whole milk and stir until you get a gummy texture that crumbles ever so slightly as you pressed it between your fingers. Heat a teaspoon or two of rendered bacon fat in an iron skillet and while you waited for it to heat, roll your harina mix into 1" balls and press them flat. 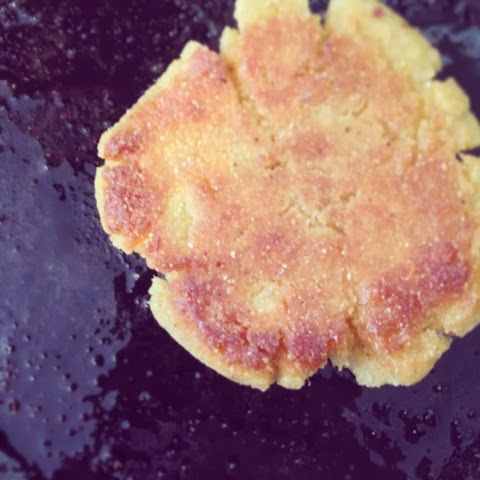 Once the oil is heated, carefully place your griddle cakes into the oil watching for oil spatters. This stuff gets hot! When both sides are browned and crisped they are ready to eat! 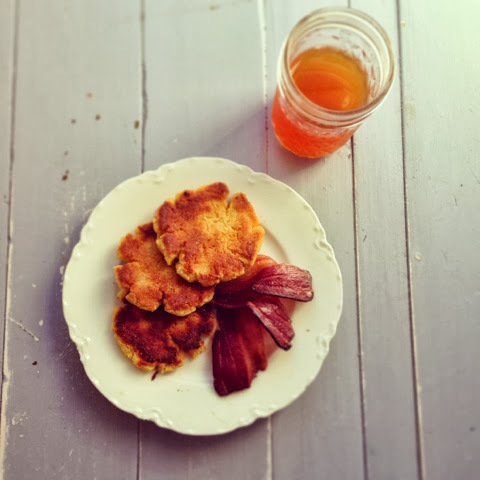 I drizzled a bit of honey on mine, and set to devouring them with a side of iberico bacon, a recent discovery. 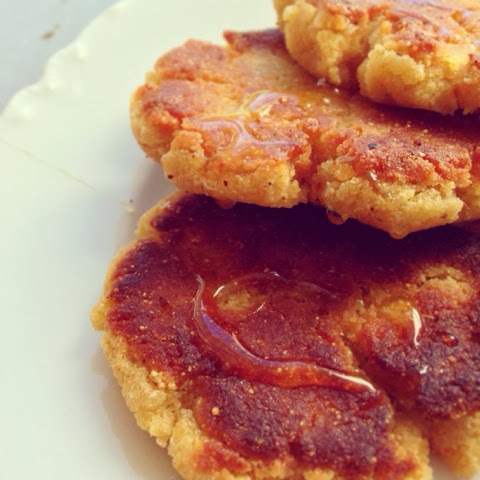 Delicious and very full of fall tastes and gluten free to boot! This would be a great way to showcase a special honey, too. Buckwheat or even black locust would be my choice. I've been on a real griddle cake kick lately. What is your favorite griddle cake? 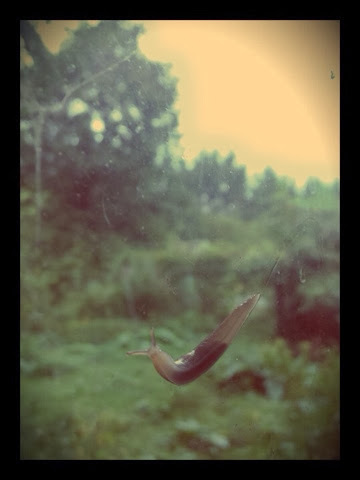 Took a quiet (and mildly grumpy in an "I'm-never-going-to-finish-this-project way) break to watch two slugs climbing the outside of my window. I've been cleaning the porch of our house for hours and I feel like I'm going in circles! Still, when I get this finished I will have a new place for my handmedown elliptical and my morning yoga. A room full of windows is the perfect place for morning exercise! It's Pear Season, at last! 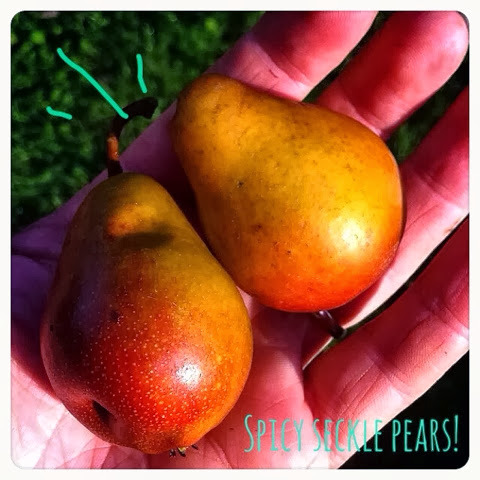 So generally the pear season starts out with the more common Williams and Comice pears but somehow I managed to swipe a windfall seckle this morning that tasted like spiced pear wine. It was the most complex taste I've experienced all summer!